A few of these trips will require a partner for more serious glacier travel (Little Tahoma, Glacier Island orbit/climb) and perhaps the Puyallup Cleaver. Otherwise it looks like I can spend my entire summer hitting the list above, especially considering I am still working full time. TO BEGIN, a little background about williswall that should shed light on how and perhaps why I have spent so much time here. When I moved to the greater Seattle area in 1983 it was because of an assignment in the Air Force, flying C-141s. As I drove into the state I thought it would be a shortcut to go through the park, in that age of no GPS or internet with just paper maps in hand. I wasn't even sure where McChord AFB was so headed for "Military Road." As I drove over Cayuse Pass I realized, even then, that Washington State was where I wanted to be. Light faded and my trip through the park in the dark had me stopping for deer and realizing that the twisting roads probably didn't save me any time (I went down SR 123 and entered via Stevens Canyon, exiting the Nisqually entrance). However, even in darkness I connected with this place. Despite growing up in Maine, I only started day hiking when I was 28 years old, discovering later in life a passion for the outdoors. 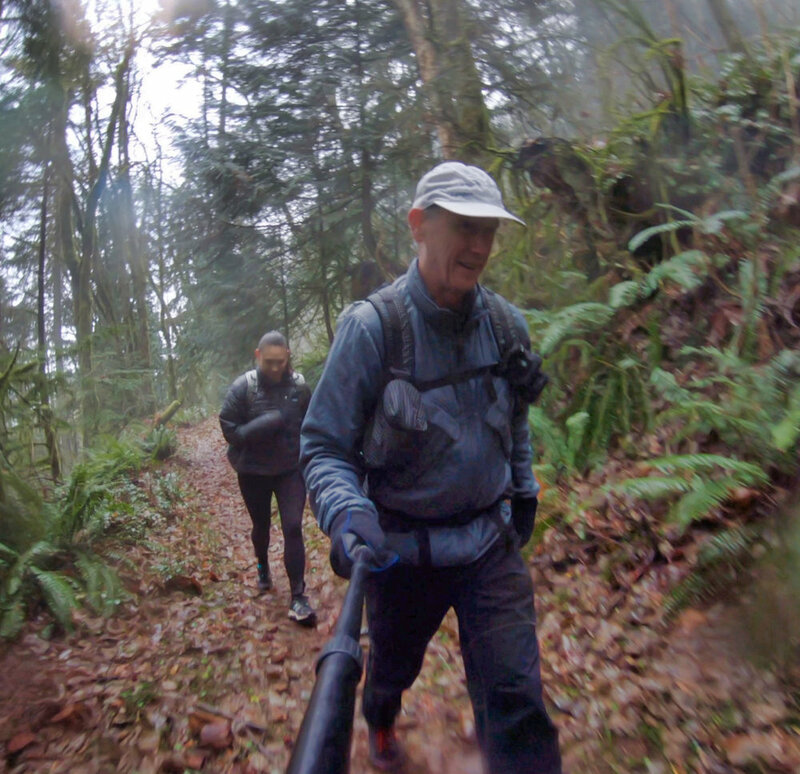 One day I was hiking from Ipsut Creek and ran into my boss on the trail. He introduced me to some off trail hiking with a jaunt to Curtis Ridge, basking in the sun overlooking the Carbon Glacier and Willis Wall, then hitting Mineral Mountain on our way back. From that point on I would venture into the park, driving the West Side Road to park at the North Puyallup lot, doing day hikes to all areas of the west side. In 1987 I decided to hike the Wonderland Trail (93 miles) and collected all manner of gear with no thought towards weight, ending up hiking the trail with probably a 50 pound pack. During those 7 days of suffering the uphills I gained quite an appreciation for weight, but persevered and was met by my wife and a buddy at Granite Creek camp with a nice meal and a bottle of wine to accompany me on my last few miles to Sunrise. IN THE 90s I ran my first marathon at age 38, eventually finishing over 50 races including Boston 5 times, 50Ks, 50 milers and a few 100s like Western States. I even won my age division a couple of times, once for doing 104 miles in a 24 hour race, and again on a 50 miler (8:18). I also took a mountaineering course on Mt. Baker and climbed a few volcanoes, including Rainier 3 times. But with young kids in the picture my time for these endeavors was limited, which led to trail running to cover distances in shorter times. I liked running the Northern Loop Trail in about 12 hours (35 miles back then) as a trainer, and even pulled off a 36 hour Wonderland over a weekend in 1999. With kid activities increasing as they aged, I stopped training for ultras in 2002 because of the time commitment. However, this background of running, trail running, ultras and limited mountaineering all contributed to the development of my philosophies on fastpacking, hiking, training, mental preparation, suffering and load management, a process that continues to this day and now includes dealing with aging (currently 63 Y/O). SO WHY WILLIS WALL? After authoring a DVD in 2006 on Kendo for our local Marsten Sensei (Kyoshi 7 Dan), I needed an avenue for marketing, so an LLC was formed. In contemplating a company name, my thoughts wandered to the immense Willis Wall and the time I had spent over the years gazing on this part of the mountain; a quick search showed that williswall.com was available. Willis Wall Multimedia was born. I MAJORED IN MUSIC in college, gaining a particular fondness for arranging and writing. I would spend hours at a piano, plinking out parts and writing scores by hand. In fact, I once spent my entire spring break copying individual parts from a 100 page score I had written, barely finishing despite 10 hours a day of toil. How times have changed! Now I can conceive, write, polish, play, and record just about anything that pops to mind utilizing a keyboard and drum controller, inputting directly to computer. I can call on a vast library of virtual instruments or record live instruments, mixing any combination. Some of my music has live guitar (not me), bass, flugelhorn, trumpet, digeridoo, drums and of course vocals. I have also embraced video, an early adopter of helmet cams; I have terabytes of archived video, mostly starting from 2005 when I bought my first high quality camcorder. This melding of music, visual and outdoors (and Kendo) is what puts the "multimedia" in Willis Wall Multimedia. As I near retirement I consider myself extremely lucky, with a marriage going on 32 years and two incredible independent kids. My health and mechanics are still good; I just ran a half marathon with my daughter and have no detriments to my activities beyond weakening vision and old man aches and pains. In fact, I am ramping up running and biking, looking forward to an awesome 35th year exploring The Mountain. I hope you enjoy these pages. I'll be frank; I had no idea what I was doing. All I had done up to that point were day hikes. I had contemplated climbing Rainier with RMI but thought that $350 was way too much. Hell, I could buy all the equipment I needed for that much and hike that Wonderland trail I had been using for my forays. With 7 days of vacation in August already planned, I started acquiring what I needed: pack, sleeping bag, pad etc. I planned on borrowing a pup tent from a friend. My flashlight was a D cell and had a big magnet on it so one could put in on a fridge or other metallic surface, surely handy on this trek. My knife was a big double bladed beauty with a burly sheath to hang on my belt. Oh, a poncho sounds good, this heavy duty 3 pounder looks to fill the bill. I don't want to run out of water, I better get this 1.5 liter container, fill it up and not plan on using it, just have it for backup. And this Whisperlite, what a marvel! I better take two full canisters of fuel though, because I have no idea how much it uses or the burn rate. Don't have to worry about clothes, these short shorts and cotton shirts will do nicely, and I can use this first generation Gore-Tex golfing jacket as rain gear, just in case I need a backup for that poncho. I better take these two reflecting tarps, to protect the floor of the tent and to stand or sit on so my tootsies don't get dirty. Don't have a camera, but my in-laws will let me use this SLR, which I can hang off my neck the whole time. I'll load up with all freeze dried food, this seems to be the only stuff backpackers eat. Now I'm ready. When I actually put all these items together, I had no room left in my external frame pack. Wow, that old school pup tent really takes up some space (must have weighed more than 15 pounds). I couldn't pick up the pack to put it on, so I had to set it on something and back into it. But I'm in good shape so no problem. My wife dropped me off at the Fryingpan Creek parking lot and off I went. The first day was overcast and sometimes drizzly, and my route over Panhandle Gap to my first campsite at Indian Bar (9 miles total) offered no views. I got really lucky though in that I arrived at Indian Bar that afternoon and everyone there, including a ranger, set up in the shelter. The skies opened and a torrent pounded outside for a couple of hours, but we were snug under the shake roof. So were the mice. Luckily Hanta Virus wasn't invented yet. Realizing I lucked out on avoiding the drenching, I settled in to one of the bunks for the evening in my 5 pound Slumberjack. Day 2 was uneventful and not too painful, being mostly downhill. My stop for that evening was Maple Creek, a total of 10 miles, and I arrived early afternoon and enjoyed basking in the sun and resting up. I do recall the bugs were out, though, and spent my time in the tent as evening approached. A couple who were hiking the trail on their honeymoon, obviously very experienced even to my neophyte eyes, came over to marvel at my tent. "Wow, I haven't seen one of these in years!" And this was 1987. Day 3: Seems my math was sketchy, as I was planning on about 13 miles per day, but Maple Creek to Devils Dream was actually 17. It doesn't sound so bad to me today, but that 50 pound pack was taking its toll. I stopped at Longmire for some snacks then set off around 2 for Devils Dream. The climb out of Longmire had my legs shaking. I remember saying to myself as I struggled uphill, "Yeah, and you wanted to climb this mountain? Uh Huh." I pulled into Devils Dream at 6 PM totally spent, and with great difficulty I set up my tent and made dinner. I was startled by 4 or 5 deer that walked through the campsite, my mind initially racing at the origin of that thumping until I gathered up enough courage to look out of the tent. Day 4 was also cloudy with no views, but thankfully no rain. By this time my shoulders and legs were really feeling the stress of that pack, and I don't remember much of the day except arriving at Klapatche Park (13 mile day) completely spent (emphasis added to emphasize how spent I was). I set up the tent and crawled into my sleeping bag for close to an hour and laid comatose trying to warm up. Someone was quite upset outside as they had a permit for Klapatche but all the sites were full. This was when the West Side Road was open and Klapatche Park was easily accessible. No one fessed up and the party left the camp totally pissed. A short time later someone packed up, probably the culprits, and exited the camp before dark. Perhaps feeling guilty or afraid of being outed by a ranger? Unsure, but I remember thinking, were that me I would politely ask to see everyone's permit in the campsites before giving up. In any event, I gathered the strength to get out of the bag and make dinner....let's see, how 'bout some freeze dried food? I did feel much better after that, and collapsed into my bag for the night. Day 5....had me thinking that I needed to quit. Everything was taking a toll on my young but unprepared body and mind. Although I had avoided outright rain, my boots had been wet from the brush since I started and my feet were starting to macerate. But as I approached Golden Lakes the sun came out so I lounged on a large rock and put my boots in the sun, watching the steam rise in the light as they dried along with my feet. The sunny weather lasted the day and thoughts of exiting the trail diminished. My stop for that night was the South Mowich Camp, for a total distance of 13 miles. By now I was getting into the routine, donning and doffing my pack, making dinner, setting up the tent, and enduring the pain of that load. I was still carrying that liter and a half of water, "just in case." Once again I slept in the shelter with some others, all of us reading the notes that were etched in the logs. I had yet to pull my knife out of the sheath or find a metallic surface to anchor my flashlight. Day 6: Another nice day and I was able to endure the climb up to Mowich Lake knowing that it was the most difficult part of the day. However, I reassessed that thought as I (taking the alternate route) continued climbing up through a socked in Spray Park, once again missing out in the view department. I dipped into the forest past Cataract Creek and came to the turnoff before the suspension bridge, hiking the short distance to the Carbon River Camp. In those days one could still drive to Ipsut Creek and there were plenty of day hikers on that section to the suspension bridge; the trail stayed right of the Carbon River the entire way (it's been closed and rerouted over the Carbon to utilize the Northern Loop Trail since 2006) and led right past the Carbon River Camp to the bridge. Another 13 mile day, the camp looked a bit different from today; I was actually on the trail crew in '99 or 2000 that went in to clear the old growth that got flattened in a localized wind, toppling old growth trees through the camp and surrounding area. Here they sit today, or remnants as cut up "cookies", slowly aging and acting as nurse logs. But then, the Carbon camp was just another woodsy enclave. Day 7: The finisher! It wasn't until writing this post that I realized that my trip was actually 7 days with 6 nights. Over the years I've posted a few times that this first Wonderland trip was 6 days. No internet, digital cameras, InReach, Strava or GPS back then, just my lame memory for recall, and I wasn't much for keeping a log. And after 35 years trips tend to blend together. However, I do remember running into a couple that were running skosh on fuel and by this time I realized that I was carrying way too much. Of everything. I gladly donated the contents of my second canister and put a smile on their faces. For this last 13 mile day the big surprise was being greeted at the Granite Creek camp by my wife and buddy, the one who had lent me the tent. They had packed a bottle of wine and some great food, and Sean actually offered to carry my pack for most of the way back. A fine finish indeed for my first backpacking trip! END: Well, I didn't actually do the entire Wonderland as I exited at Sunrise. In those days the trail ended at White River and trekkers had to walk the road for two miles to regain the trail before Fryingpan Creek....I couldn't see the point of this at the time, but it escapes me why I didn't plan on exiting at White River. I omitted 6 miles of the trail and turned in 87 vice 93. It wasn't until some time later that the park created the trail section between White River, crossing it and proceeding through a nice wooded section to join up before Fryingpan. If you've ever wondered why there is an offshoot trail from the Wonderland that leads to the road, that is where the trail used to end. The lessons learned on this first trip launched my search for better gear, better techniques, better footwear, nutrition etc....a process that continues to this day. 28 years later (2015) I waltzed around the mountain in 3 days at age 60 with a total pack weight that was less than that old pup tent, including food and water. Nostalgia is great, but evolution is better. I do kinda wish I had that hair and flat gut, though. I recently did a trip to the stomping ground over a short period of cold but clear weather, mixing it up discipline wise. Over the years I have come to do various biking trips in the park, and during the winter the 11 mile road from Longmire (2800') to Paradise (5400') is open, at least from about 9 AM until 5 PM. 10 years ago I used to think that this 2600' climb was quite the workout, but like anything else, one becomes adjusted, at least mentally. On this past Tuesday (2/13/18) I decided to do a usual February ride but tacked on some hiking to the Muir snowfield to complete the day. I'm finding this mix of disciplines very invigorating, and on numerous occasions I have biked into the park (before the roads are open to vehicular traffic) toting skis, then hiked or skinned to various places, then skied back to the bike. I like the challenge of equipment and clothing choices. For instance, on this latest foray (with temps in the 20's) I wore some biking thermals top and bottom with a Beyond Clothing jacket. The Rig jacket fills a sweet spot in that it is breathable enough for the climb, yet warm enough for the frigid winds I encountered after climbing above Panorama Point. For footwear a pair of Inov8 ArcticClaw 300's, an insulated and spiked winter running shoe, kept my feet warm all day with no gaiters or covers, even on the invigorating descent. A balaclava for the head and 3 pair of gloves (one for climbing on the bike, a pair with zippered backs to free up fingers for photography in the hike section, and an insulated lobster pair of Pearl Izumis for the descent) completes the picture. If I am skiing I take a pannier and put the boots there, changing out of trail runners when off the bike. Or, if the approach is long and not on snow, I will take my HMG 4400 pack (customized for skis) and carry the skis A frame with the boots buckled in. I've learned a lot from mixing disciplines, not just clothing and equipment wise, but nutrition and hydration aspects also. There's a lot of clothing choices in the bike side that work well for hiking. On summer trips on snow I'm usually wearing some sort of bike gloves, including skiing. And the workout choices are innumerable. Want to bike the West Side road to hike? An excellent way not just to vary the workout but to quickly access trails on the western side of the park, enabling one day trips. One of the most unusual trips I've done is biking the closed portion of Highway 410 (low snow year), into the White River entrance of the park to the Fryingpan Creek trailhead, then hiking to Summerland. Or making a loop by biking from the Stevens Canyon entrance to Owyhigh Lakes trailhead (18 miles/2600' climb), the hiking back to my vehicle (17 miles/2600' climb). Or just biking the whole park for a real quad buster. By judicious use of timing (i.e.,biking closed roads) I have had plenty of solitude in Mt. Rainier National Park these past few years, even in the dead of summer. Whether it's for training, suffering or just plain fun, one can romp around the roads, hike the trails, go off trail, ski, run...the possibilities are endless, which is why I find myself going back here over 35 years. Yes, it's in the plans. But this year I want to go "faster", less like the 3 day fastpack I did in 2015 and more like the 36 hour sufferfest I did in 1999; tempered to arrive at an endeavor somewhere between these two. Ideally I will start at Longmire and proceed CW to get the hardest part of the trail done first, but continuing past Mowich Lake (35 miles) for a push to the area of 50 miles. Then one rest period of 3-5 hours, then the remainder to finish. Preparation is paramount, so I'm building on resurrected running. These past 15 years I have done just enough running to be able to do about 5 miles if needed, which equates to 2 - 4 times per month. This minimalist running schedule simply reminds the legs and body of the activity, keeping total atrophy at bay. Combined with biking, Kendo, skiing and hiking, I maintained a base to work from. But, since my daughter has graduated from college and can't really swim anymore, she has talked me into running a few races with her, a half marathon in December and a 15K in March. This necessitated I pick up the running specific training. SLOW: TRAINING OVER 60....one of the hardest things to do in a training program is to let go of past times and concentrate on the now, and it has been a long slow process. At 63 it is paramount that I don't increase training by more than about 10% over a 6 to 8 week time frame, as being too ambitious leads to over training and injury, and nothing derails a training program worse than injury. I am running a half marathon with my niece in Boston next month and I told her I'm gonna be slow. The last one she ran was 1:35, my best time was 1:28. I anticipate something between 9 to 10 minute mile pace. However, it's coming back, with finally some good runs in the log book. If I continue the training through the summer I should be in fair shape. SPECIFICITY....I'm about to start trail trotting, probably the most important part of this program. Treadmill running is great to get things going, do timed intervals, and adjust the body to running. But to do a "fasterpack" of the Wonderland with the above itinerary I need to move efficiently for hours on end; I won't actually run but rather slowly trot the downhills and level sections. Relentless forward movement, the mantra of ultra running. So my legs will need to be adapted for efficient climbing and constant movement. Luckily my neck of the woods has excellent training areas; in fact, I can walk out my door and within 1.5 miles be on trails that can take me to Issaquah and back. I have Cougar Mountain, Squak Mountain and Tiger mountain regional parks at my disposal, the training ground of many local ultra runners. When I can go trot for over 30 miles on a trainer I'll be about where I need to be. • ZPacks Pocket Tarp: at just 3 ounces I can use this to wrap up in during rest, or just drape over me. If I am only resting for a short period, I can leave the stakes at home. • Gossamer Gear LT3C poles. For trail hiking I find poles almost indispensable for pace making, creek crossing and overall stability while moving quickly. I've had my GG LT3s since 2007, logging thousands of miles. 5.8 ounces. • Clothing: either some running shorts or compression bottoms, an OR Echo Hoody (long sleeve for sun protection), Enlightened Equipment Copperfield Wind Shirt (7d, 1.8 ozs) and EE custom Copperfield Wind Pants (I am testing a hybrid pair, 20d front and 7d rear, 1.4 ozs), EE Torrid Hooded Apex Vest (5.8 ozs). Add in socks (2 pair), running shoes (Inov8) and a Headsweats cap. Lastly, a ZPacks Poncho/Groundsheet at 5.7 ozs. • Pack: My lightest option is my custom ZPacks Zero at 4.7 ozs. On deck, either of 2 custom Zimmerbuilt packs under a pound. No, I'm not going to fuss over grams, I'm simply thinking of what I can take to be comfortable over perhaps 48 hours, including sleep and shelter gear. If I change plans for whatever reason to a more traditional backpack/fastpack, I will use my ZPacks Hexamid X (yet to be delivered (#2) for testing, about 14.8 ozs), a full pad, and perhaps my 50 degree EE quilt. Either way I anticipate my pack weight to be unnoticeable at under 10 pounds, including food and water. Also worth mentioning, I am making the effort to equip with US made products. Will I avoid injury? Will I be able to complete my training program? Will the stars align for time off and weather? Can I pull this off in celebration of 35 years wandering the park? Check back. 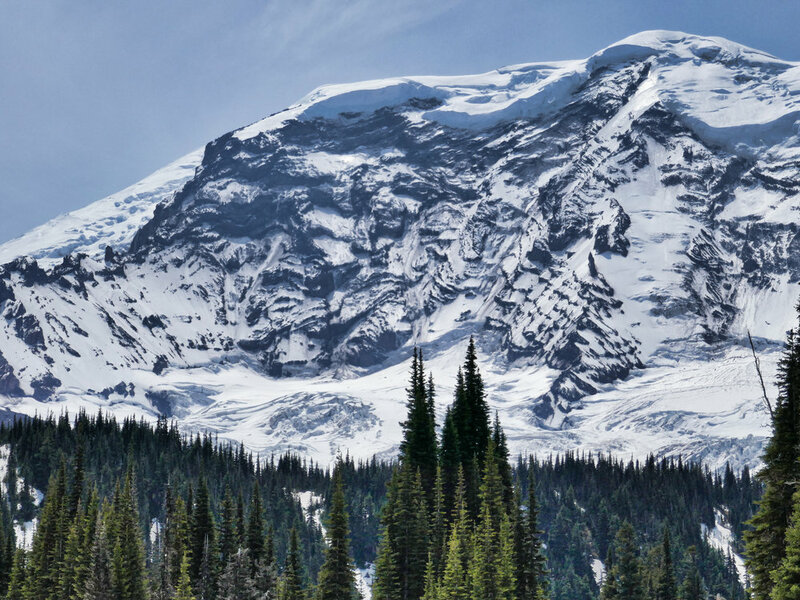 Little Tahoma was scheduled but weathered out and the rest of this list didn’t come to fruition either….I did manage to get to Van Trump Park but didn’t make it to Wapowety Cleaver, and I did go a bit up the Colonnade but was turned back by snow early season. One thing I’ve learned over the years is to have goals but do your best and chill if the list isn’t completed. It’s been a good year despite falling short. EQUIPMENT I’d like to touch briefly on some observations and experiences with gear this past season. My usual method was to look at each trip and pick from my quiver for appropriate gear. Of note, my trip to Natural Bridge involved a 27 mile day with 10 miles of biking with possibility of rain. I opted to pack my Zpacks Poncho instead of a rain jacket and ended up wearing it for a good portion of the hike. I was pleased with the decision, proving that the venerable poncho still has a place in the gear closet. I never broke out a tent, even the new Plexamid from Zpacks….most of my solo endeavors were day trips with the exception of one night out on the Wonderland push, where I slept for only 3 hours as planned. Not only did I leave a tent behind, I didn’t even pack a sleeping pad or a bag. I slept on a soft rather mossy area right next to the trail in a Borah Bivy Bag in a puffy jacket. Guess I didn’t want to be too comfortable. The one overnight I did with my daughter (in fine weather) we opted for another open bivy on Ptarmigan Ridge. On many of my forays, especially the long days or multiple day hikes, the nights were spent in my pseudo Avalanche RV. So the Duplex and Plexamid stayed packed this season. A few years ago I did a blog post on Beyond Clothing. Yes, I still use these pieces. Of note, I’ve been using the Polartech Alpha jacket on late season training hikes; in fact, the last one I did involved over 3,600’ of climb and about 19 miles and the jacket stayed on the entire time. Polartech Alpha has proven itself over and over again as a true active piece that vents and breathes well yet provides considerable warmth. I’m surprised I don’t see more of this making its way into the mainstream, I don’t seem to hear much about it. My various pairs of Inov8 shoes still work like a charm. I finally tossed one pair I’ve used for years only because they’ve been chewed up from some rough cross country travel and I was afraid of imminent failure like sole separation; I retired them after my Wonderland Trail hike #31. Haven’t had a blister this year. I picked up 2 more pair of OR hooded Echo T’s this year on sale. Aside from biking, they’re practically on every outdoor endeavor, including a recent half marathon in Seattle. Aside from the sun protection the hood provides (especially on snow), the hood also retains just that little bit of heat when needed without donning a hat. Nunatak; some of the best products available, be it bags, quilts or clothing. I’ve done a few reviews (3D 15 degree quilt/Skaha Apex pullover) and plan on a couple more purchases this coming year, namely the Nova Insulated Bivy and the PCT Jacket. All this gear is meticulously made, conservative in ratings and backed by outstanding customer service. I haven’t been on a hike or bike yet this past year without something Nunatak in my pack. Cameras: I’m very pleased with my Panasonic G9, especially paired with the 8-18 Leica lens. And for Christmas my family gave me the latest generation of GoPro, the Hero 7 Black. Preliminary tests promise excellent improvements over my Hero 5, especially in the stabilization department. If you peruse this site’s myriad videos you’ll see that I incorporate lots of helmet cam footage in most of what I do. The 7 follows prior purchases over the years of the aforementioned Hero 5, and before that the Hero 3 Black, the Hero 2, plus 3 Contour cameras including the first one when it was called VHoldR. Quite a difference in the quality from those first iterations. I recall having to deal with some very funky yellow casts in my Hero 2 whilst time lapsing the Wonderland in 2012 during post production. PITA, but now so much better. Lastly I’ll mention the Lumix ZS100, a travel camera I bought for my wife but have taken on many outings due to its small form factor. Especially handy is the 25-250 zoom lens (1” sensor), enabling shots I couldn’t get on my G9 without the zoom attached vice the 8-18. As this year of 2018 comes to a close I give thanks to my continued health but don’t take it for granted. I’m looking forward to great sojourns and adventures in 2019 and wish you all a Happy New Year! Willis Wall: utilizing the 25-250 zoom on the Panasonic ZS100.